Though in the past, not much attention was paid to the seating, especially in the office, nowadays we know better than to simply ignore the benefits of a proper chair. It was a long way until people, or rather employers, realised that improper and prolonged sitting doesn’t only lead to lack of productivity but also increases the chances of injuries and health issues, like MSDs (accounting for 60% of injury claims in Australia), stress, anxiety, lawsuits, and sick leaves. This is how chair ergonomics have become a must in the office workplace. It wasn’t easy to go from the 1920s backless benches to the cosy long-term designed chairs of today: What was previously thought of as obstructing work, and leading to laziness, turned to be essential for an office worker over the years, and that is nothing else than comfort. The philosophy of ergonomics (i.e. office comfort) only became popular in the 1980s when the computer became an essential piece and it hasn’t waned since then. Okay, it’s true it’s still taken lightly by some, but it’s a fact employees sit about 8 hours per day on average and they require the adequate support to get things done, so a comfy chair equals more efficiency, and as a result more income. Even German chancellor Otto von Bismarck knew the importance of a good office chair in the 19th century. When the costs of work-related injuries add up, the outcome is 4.1% of GDP, or $61.8 billion of the Australian economy. Not so difficult to see why the adequate chair is a necessary investment, right? 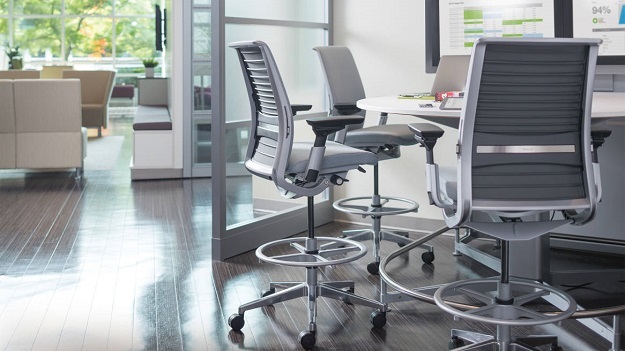 There’s no universal chair to this day that’s ideal for everyone, but there are countless options of chair ergonomics you can choose from, ranging in width, height, as well as their features in terms of lumbar support, armrests, neck rest, and adjustability, so they can suit the individual needs of every employee. Just because they are comfortable doesn’t mean they lack in aesthetics too, in terms of style, fabric, and colour. Of course, as important as the choice of ergonomic chair is, there’s the risk of injuries being posed by not knowing how to make use of all the features, particularly the adjustability. This means training is also required to be able to make the most of them and avoid injuries. Though it’s been widely discussed that another 1980s creation, the standing desk, would replace chairs, prolonged standing isn’t that beneficial either, so making the best of both worlds would be to alternate between sitting and standing, every hour or so, making minibreaks. As much as ergonomic furniture makes the office a better workplace, it’s essential to go for walks as much as you can. Walks can do wonders for your health, and not a couch potato lifestyle!